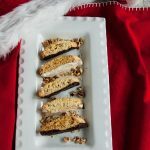 These Chocolate-Dipped Hazelnut Biscotti get their flavor from hazelnut liqueur & toasted hazelnuts! 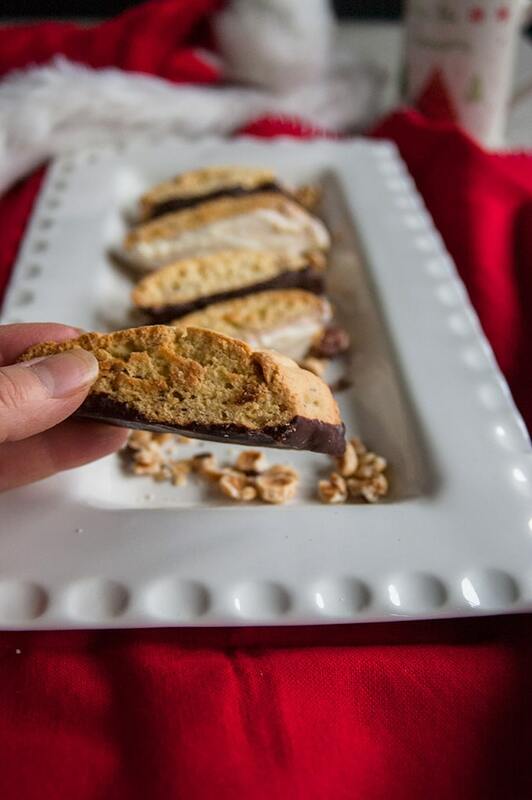 Plus, I’m sharing the real definition of “biscotti” and some step-by-step photos to make them. 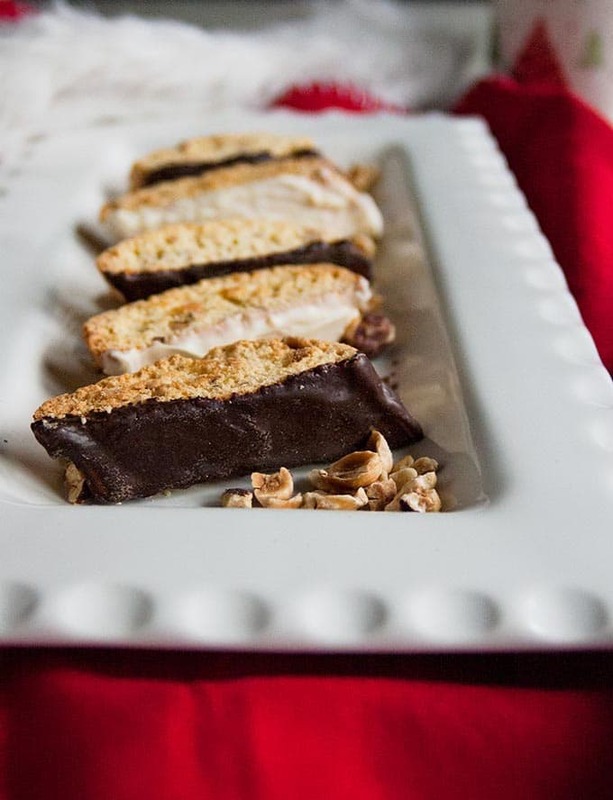 In America, “biscotti” refers to twice-baked crunchy cookies, such as these Chocolate-Dipped Hazelnut Biscotti. Yum! I guess, somewhere along the line, somebody botched the translation. The Italian word for the type of cookies I’m sharing today is actually “cantuccini,” referring to Tuscan cookies that usually have almonds in them and are dipped in Vin Santo wine. Now that we’ve got our linguistics lesson out of the way, I need to tell you Mom always used the word “biscotti” to refer to her Italian Cookies, which are often flavored with anise or vanilla and have glaze and sprinkles. Can you see where this is going? Are you getting a hint of the culinary confusion that would cause me to humiliate myself on the job, while planning a dinner for donors to a world-class orchestra? Well, let me tell you about it. 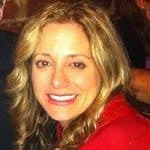 Thanks to growing up in an Italian bubble — picture one with green, white and red vertical stripes, and my face peering out from the center — 26-year-old me told the caterer to put out trays of biscotti for dessert…at a sit-down dinner…before an orchestra concert…in the fanciest of performance halls. I was picturing well-heeled guests, perhaps with pinkies in the air, reaching for dainty, frosted cookies. I wasn’t planning for attendees in concert attire to have to dunk their biscotti in coffee to avoid breaking their teeth. So, I marched up to the caterer. “I ordered biscotti!” I hissed, sotto voce (in a quiet voice). “Those are biscotti,” she retorted. “I meant the soft ones, with the glaze and sprinkles…” my voice trailed off as the caterer stared at me like I had three heads (#Italianproblems). Cue The Twilight Zone music. I was so mortified, I never told that story to another soul. Not even Mom. It seems fitting to share it on the internet now. We’re all friends here, right? 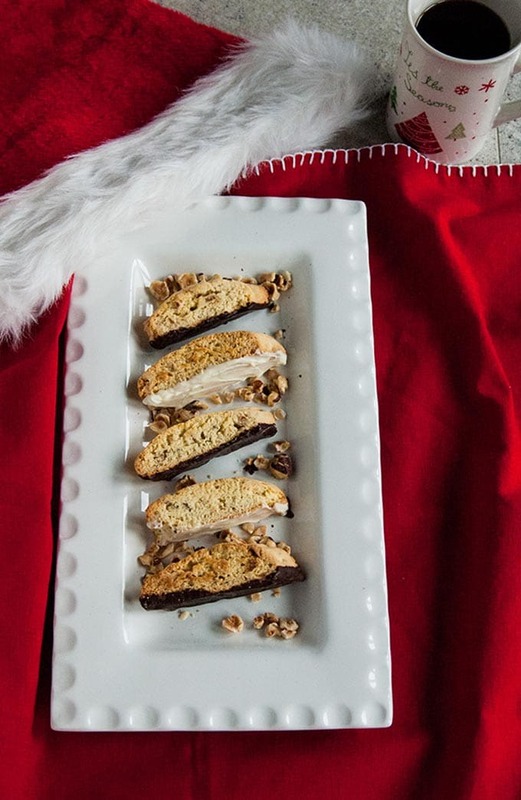 See, I made Chocolate-Dipped Hazelnut Biscotti for you. Here are some step-by-step photos of the process. 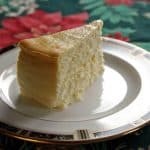 I added Frangelico (hazelnut liqueur) to the batter, but you can substitute a teaspoon or two of almond extract, if you wish. Just don’t skip the step of toasting the hazelnuts in the oven. It’s necessary to bring out the flavor. And, I dipped the cookies in chocolate —some in dark chocolate and some in white chocolate. But, they’re good plain too. 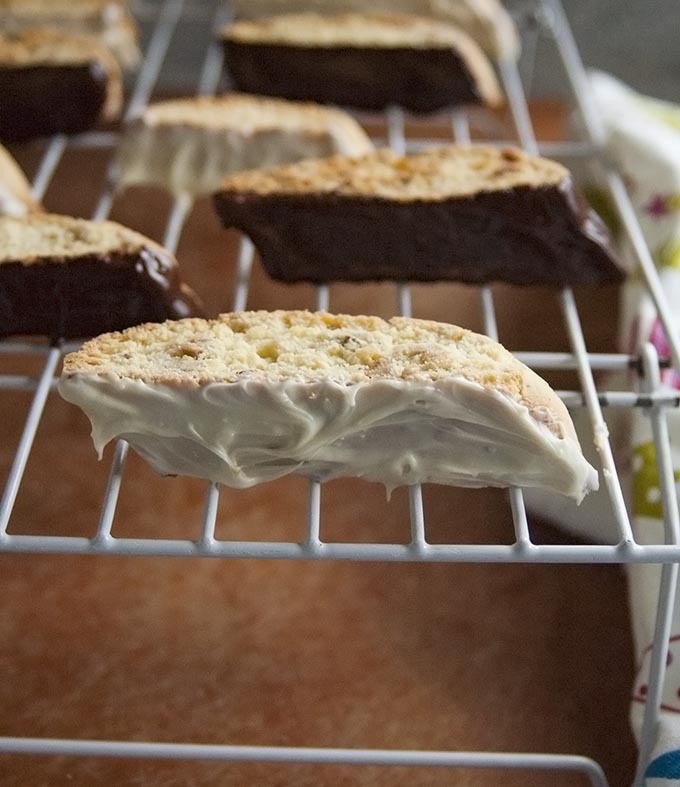 Just don’t forget to dunk your biscotti in coffee (so good together!) or hot chocolate, or even cold milk, if that’s your thing. I don’t want anyone to break a tooth. Just kidding, but they’ll be dry otherwise. 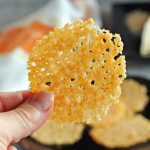 A delicious Italian cookie to dunk into your coffee, hot chocolate or cold milk! Heat your oven to 350 degrees F. Place your chopped hazelnuts on a rimmed baking sheet and bake them for 10 minutes, stirring at the halfway point. Let the nuts cool on a wire rack. If your butter is not softened, heat it in the microwave on defrost for four seconds at a time. In a large mixing bowl, add your softened butter, eggs, sugar, liqueur, and vanilla and beat on medium until blended. In a medium bowl, whisk your flour, baking powder and salt. Add the flour mixture to your egg mixture and stir it in. Stir in the toasted hazelnuts. Blend it as best as you can with a spoon. Bake the dough logs on a greased baking sheet or one lined with parchment paper for 20-25 minutes. You don't want to brown the dough. Remove the dough logs from the oven and let them cool in the pan for 10 minutes. Keep the oven on, since you will need it again. 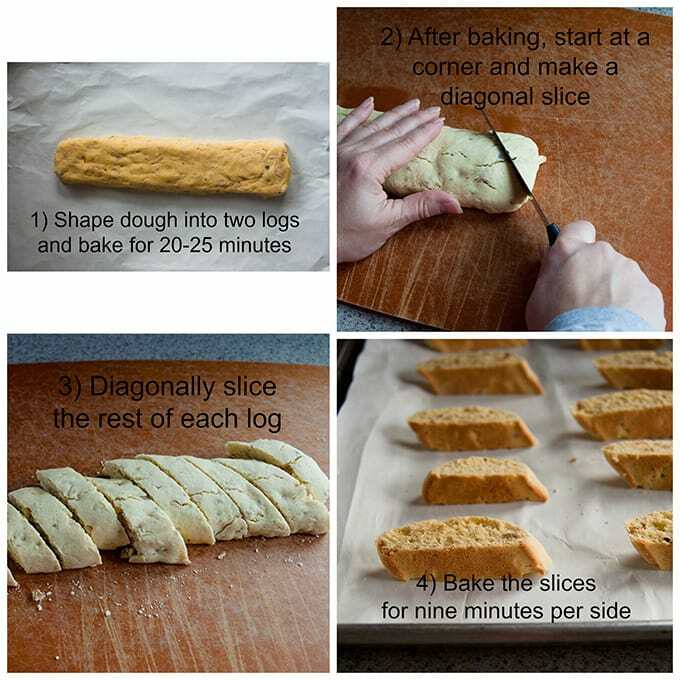 After 10 minutes, slice the dough logs on the diagonal, starting at one corner. (See photos.) Continue slicing the logs diagonally into strips 1 inch wide. Arrange the slices with the cut side facing up on your baking sheet (they brown more nicely if you don't use parchment). No grease is needed on the pan. Bake the first side for 9 minutes, then flip over the biscotti and bake the second side for 9 minutes. Cool the biscotti on a wire rack. For the chocolate dip, place your dark chocolate chips in a small, microwaveable bowl and lightly cover it with wax paper. Heat in the microwave on high for 20 seconds at a time until the chocolate begins melting. Stir and heat some more if needed, until your chocolate is melted. Repeat with another small bowl and your white chocolate chips. Let the biscotti dry on a wire rack until the chocolate hardens. If you don't wish to use the hazelnut liqueur, you can substitute a teaspoon or two of almond extract. I believe the Italians invented biscotti as the perfect dipper for espresso and I can’t wait to make these so I can taste the Frangelico. These look delicious. If you dip these in espresso, you’ll have the ultimate biscotti experience. Enjoy, Janette! 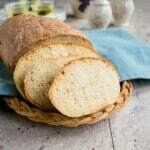 My kids love biscotti, I will have to make some this weekend. They’re such a nice treat (but not too sweet) to have around the house. I love them with my coffee. Enjoy, Maria! I’m thinking I’m going to need to make these! I love biscotti but haven’t gotten around to making it myself. Hazelnut and chocolate may be the impetus I need. They’re really fun to make, Theresa! Enjoy. 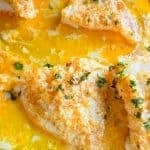 Great recipe for on of my favorites. I love the fact that these are dipped in 2 flavors of chocolate, too! Both kinds of chocolate work really well with these, and it’s a good way to satisfy everyone in my household. Thanks, Dan! It just doesn’t get much better than chocolate and hazelnut ~ I’m working on a box of cookies to send out to family this week, and these biscotti are now on the short list! This looks delicious. I’ve been wanting to make biscotti. I’ve never made it, but only eaten it. I think its time to try my hand at it! Go for it, Cindy! It can seem intimidating, but it’s actually easy.